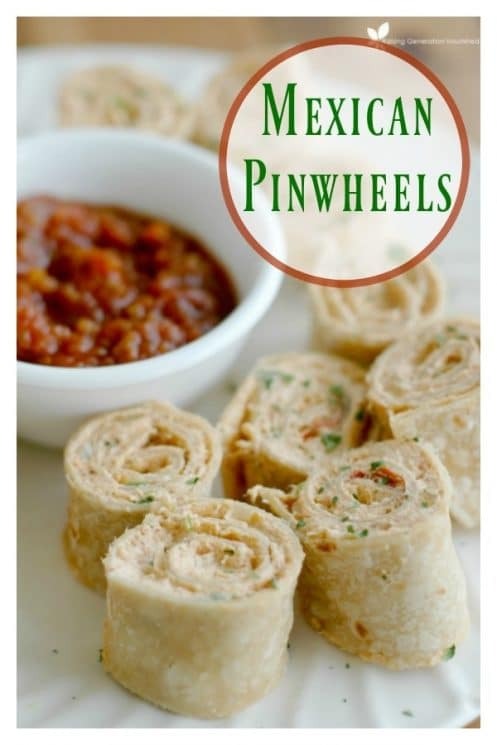 Mexican Pinwheels : Perfect for Quick Lunches, Fun Appetizers, and easy Lunchbox Additions! 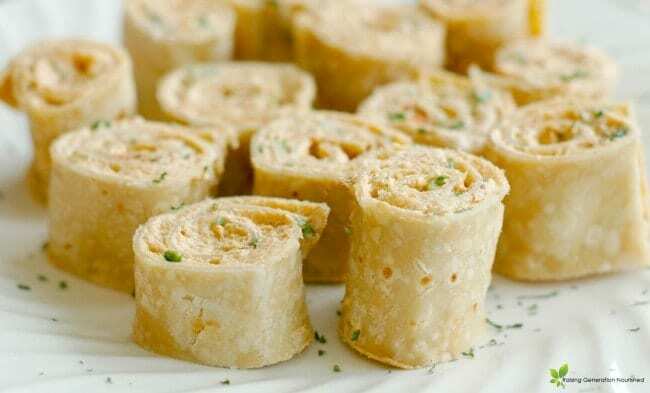 All of your favorite Mexican flavors all rolled up in a bite-sized, finger food meal perfect for kids! 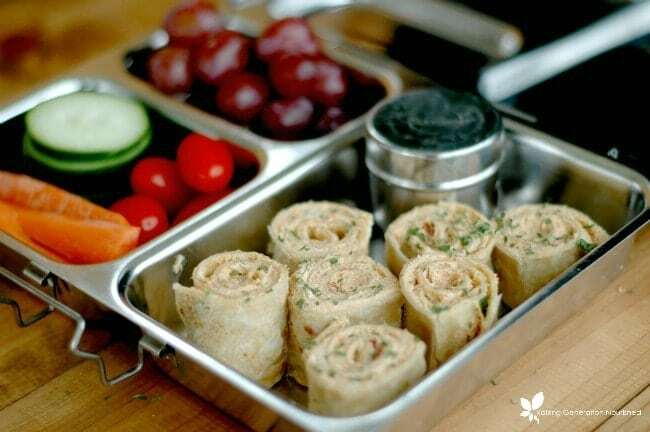 Ok so halfway through the school year and I don’t know about you, but I am ready for a lunchbox change up! My daughter has been really into wraps this year and I feel like we mix it up with the variety pretty good. She enjoys kid friendly tuna salad and egg salad pinwheels as well as just simple PB and J roll ups. What I love about doing roll ups or pinwheel style wraps is that they stay together well. They are great for little hands so everything doesn’t just fall out of the wrap! 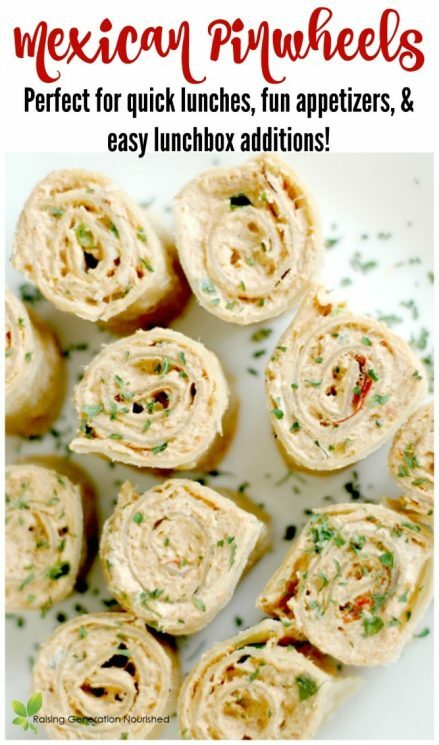 Here is a fun twist on a lunchtime pinwheel that can be great for using up the last of some chicken from dinner and a few other ingredients you already probably have around! I have even made these using leftover re-fried beans from dinner instead of chicken so if you follow more of a vegetarian diet you can use beans. Since we are a gluten free home, there are a couple different gluten free wraps we like to use but pretty much anything will work! You can also play around with the taco seasoning to your family’s preferences – the recipe as is turns out very mild. One of my kids loves (loves!) spicy food so I tend to make it a little spicier than this. 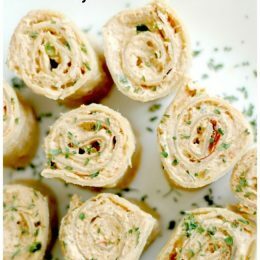 I also think these would be a great appetizer at a party, or a fun finger food dinner on a Friday night when you are just *done* with cooking for the week! Renee blogs at Raising Generation Nourished, and with 3 girls ages 6 and under, she is passionate about raising the next generation of kids with a better understanding where their food comes from and how food affects their bodies. Put everything but the tortillas in a bowl and mix well. Cut the rolled up tortillas into 1 inch sections. They are a little easier to cut when they have chilled in the fridge about 20 minutes but I rarely have patience/time to do that! What gluten free wraps do your kids like? I have had a hard time finding any that they like! Hi Kristin! These are the Food For Life Rice Wraps. 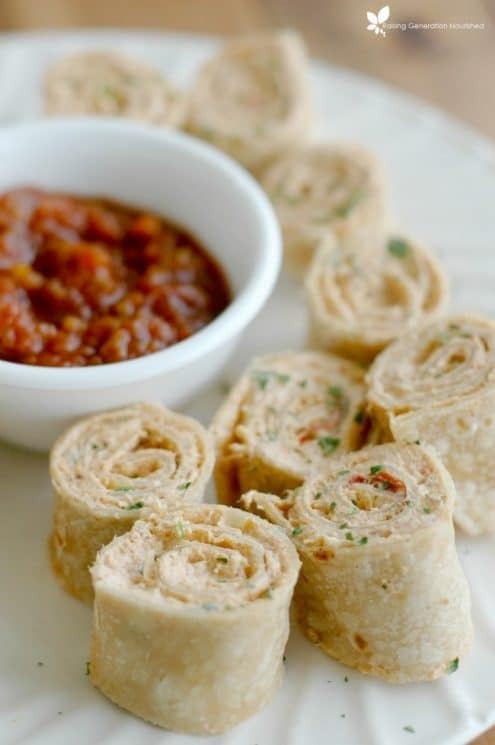 We also like the Sami’s Bakery Millet wraps! How do I add this to my recipe box? It looks great! Hi Amanda- This wasn’t one of the recipes we added to the database. Give us a day and we’ll get it in. I’ll let you know when it’s done. Thanks! OK Amanda- should be working now! I’m pretty sure it’s not supposed to be 8 cups of cream cheese and I’m wondering if thats what’s making the nutrition information so astronomical? I thought these were delicious, but my 5 and 3 year old did not. I think it was the amount of green onion, so maybe next time I’ll cut back to 1 or 2 stalks. Delicious! We passed on the green onion. We struggled with the pinwheel part. They fell apart when we tried to cut them. Instead, we ate them as roll ups. We will definitely make these again. They are so easy. We used grilled chicken breasts that had a bit of a crust on them. That made them extra yummy. I added cilantro. tomato, avocado and lettuce. Great way to use up the leftover rotisserie chicken. This did not turn out very good. I would do without the taco seasoning, as it was too overwhelming. Yum! I add celery and grapes or apples to mine for extra benefits. This was great! I added a can of chunk chicken breast in place of the rotisserie chicken. Kids loved it! Great and easy recipe! Made it for a little family picnic, everyone ate it! How do these work for making ahead? Do the wraps end up getting soggy? If these are 139 calories a serving, what constitutes a serving? The servings size must be very small, like 2 slices? Is that correct?